Includes flat sheet, fitted sheet and one pillowcase. This ultra soft and 100% polyester, both comfortable and versatile. 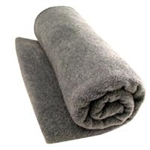 Plush micro-fleece is brushed on both sides. A wonderful luxurious addition to any spa or salon. Easy to care, machine-washable. Reversible, available in Espresso and Cream. 60"W x 90"L.
Produced with an ultra soft 100% Polyester Microfiber, and quilted with Herringbone stitch on both sides. Machine-washable material for easy care. 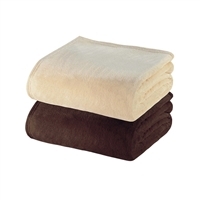 This cozy blanket provides warmth without weight to keep clients comfortable in colder environments. It is an excellent choice for any spa. Available in Espresso and Pewter. 60" x 90". Due to the hygienic nature of our sewn products, they are non-returnable, except unopened and due to a manufacture defect. 100% Cotton. White, 66" x 90"
Fits most crescent head rest s.
1 flat sheet. Top sheet 63" x 100". 100% polyester microfiber. Machine wash warm with like colors, gentle cycle. Use only non-chlorine bleach if needed. Tumble dry low heat. Made in China. Available in cream or white.